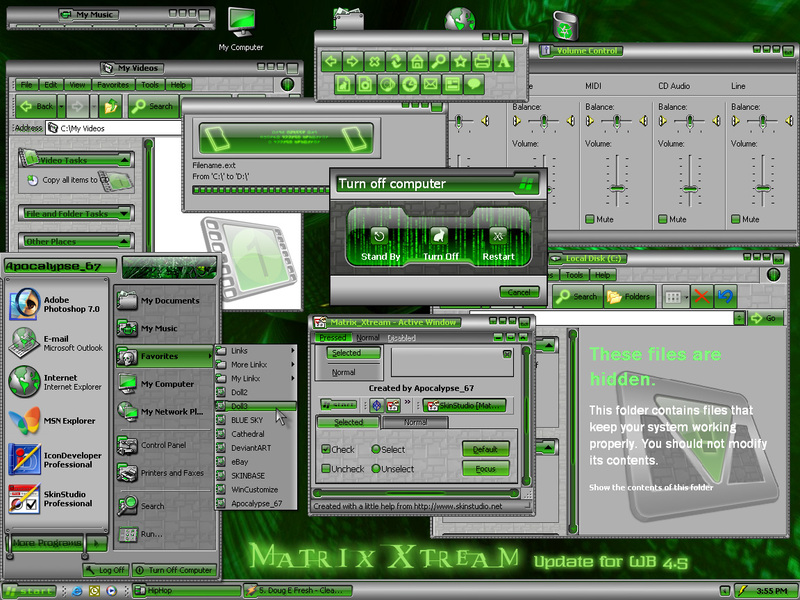 Many people have asked for a skin to go with my Matrix_Xtream wall, so I decided to put this one together. I hope you all like it. looks great!!! I'll give it a ten if i can get it in blue to match the blue wallpaper you made earlier. Very Nice. I already had the other Matrix_Xtream stuff so now I have a cool set. May have taken you a while, but worth the wait. Whaouuu, another very nice one over here !!! and it comes so well with my pseudo name ..
Wow.........looks like a great skin,a pity I can't download it. I don't know why I can't download any of the latest skins I am singned in a still nothing works. Tried loggin in and out... still can't dl or see previews of skins. Still, this skin looks great. can't wait to peep it once the problem gets fixed. Its a shame that the server problem has kept so many of you from downloading the skin. Hopefully this problem will get fix soon. but thank you all for the interest in the skin. Ran-D I thought about making it in blue, but I wanted to add a green skin to my library. I'll probably release a blue version soon. Malakai Im glad you like the roll up/down feature. Thankx for pointing it out.